Other options makes the program easier to use. Saving the size of the game window. Saving the place of the game window on the screen. Saving the game while logging off. 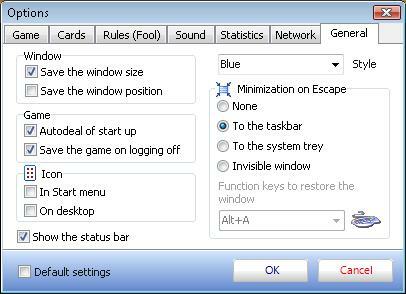 Minimization of the game window. In case the program shuts the game will still be saved. To restore the game you have to tick this option. The saved file goes under the following name "Exit_Player.sav", where "Player" is the name of the current player.